Though New Jersey Transit lists the stop as the “Princeton Station,” locals refer to their train as the “Dinky” or “PJ&B” (Princeton Junction & Back). Recently, the station moved several hundred feet from its former site near University Place along Alexander Road, making it the talk of the town. Protests of a planned replacement of the little train with a bus spared this bit of Princeton history, which most of our readers are likely to remember. As it happens, the “Save the Dinky” movement echoes a nineteenth-century protest that both saved the train and created its route. Aside from a short-lived Boston & Albany route that ran 1.2 miles in the early 1950s, Riverside to Newton Lower Falls (Massachusetts), this has always been—and remains—the shortest passenger train route in the United States. Here we take a look at how Princeton got its tiny train and kept it running. 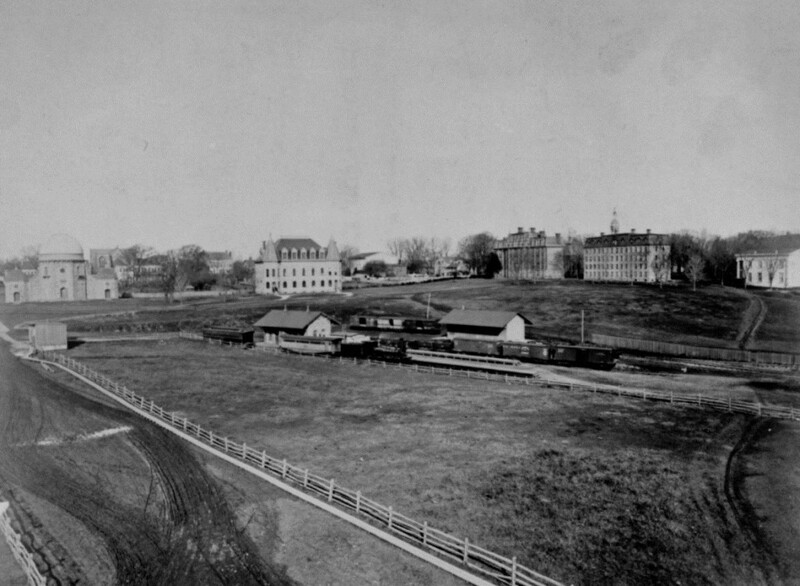 Princeton Station with the College of New Jersey (Princeton) campus visible in the background, 1870. Office of Communications Records (AC168), Box 91. In 1839, Princeton got its first train station at the foot of Canal Street (now Alexander Road) on the main line running between Philadelphia and New York. The Civil War brought high demand for both passenger and freight travel along the line, so the railroad built a new line from Trenton to New Brunswick, removing the curve toward Princeton that was slowing trains down. This is the route New Jersey Transit follows today, taking the main line three miles from campus to Princeton Junction. Local residents vehemently protested the move, convincing the railroad company to build a new line connecting Princeton to the Princeton Junction station in February 1863. The train stopped at what is now just in front of the steps of Blair Hall. The “Dinky” made its first trip in May 1865, a three-mile trip that took 20 minutes. Although turntables allowed the train to face the other way, often there was not enough time to turn the train, and passengers frequently made the entire trip running backwards. Although having the train run through campus was convenient in some ways, it posed problems in others. After its construction near the station, residents of Blair Hall complained that the trains woke them up at night, and that the smoke and soot from the train got all over their dorm rooms. In 1918, the station moved to the location near University Place, slightly shortening the ride to Princeton Junction. This gave Princeton University seven acres of land to build new dormitories, and Blair residents relief from soot-covered clothing and furniture (a moot point as of 1933, when an electric train replaced the steam-powered locomotive). In 1975, another modernization came in the form of air conditioned train cars. The station remained at University Place until its move to a temporary location in 2013 and its current site in 2014. Researchers interested in the history of the relationship between Princeton University and the Dinky/PJ&B station have several different sources available to them in our collections, including a recent digital acquisition. The gallery below has been assembled from across multiple collections. This entry was posted in Campus Life and tagged Dinky, PJ&B, Train station by April C. Armstrong. Bookmark the permalink.